Where is Our Next Course Taking Place? The Greater Niagara Frontier Council will host the 2020 Wood Badge Course on May 1-3, 2002: Camp Scouthaven and June 6-7 2020: Camp Schoellkopf. For more information on Wood Badge, view the the article "Why Wood Badge" in the March/April 2014 issue of Scouting Magazine. Phase I is the practical phase. That phase consist of two, weekends (5/1-5/3 & 6/6-6/7). You must attend both weekends. You must be present at both weekends and you will have to attend small group meetings between the weekends in order to complete Phase I. The 1st weekend begins at 7:30 am on Friday, May 1, 2020 and concludes between 5:30 - 6:00 pm on Sunday, May 3rd. The 2nd weekend begins at 7:00 am on Saturday, June 6, 2020 and concludes between 5:00 - 5:30 pm on Sunday, June 7th. You MUST attend all dates listed above to successfully complete the course. During the weekends you will be developing a series of goals that you would like to accomplish in your Scouting job during the application phase. Once you have accomplished your goals to your satisfaction and that of the assigned counselor the WOOD BADGE will be awarded. The course fee will be $300 (if paid in full by February 1, 2020 the cost will be $260). The cost includes the cost of all meals and training materials. Full Payment is encouraged at the time of registration. However; to insure a place in the course, a minimum deposit of $75 is due at time of registration. Introduction to Outdoor Leadership Skills for Boy Scout Leaders (others may take this course, if desired). Scoutmaster Fundamentals is still valid for this requirement if taken in 2001 or prior. 3) Be capable of functioning safely in an outdoor environment. Successful completion of the BSA annual physical form is required for all participants. 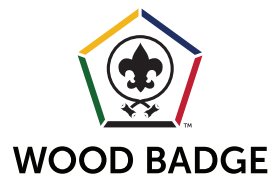 Wood Badge is a Class 3 activity and requires medical approval. Ready to register or look at the Application. Please click on the links below.